Kare-kare is a Filipino dish originated from the culinary capital of the Philippines, Pampanga. It is made with fork tender meat and vegetables swimming in a vibrant orange colored peanut sauce. It lacks the saltiness of a usual dish and always accompanied by sauteed bagoong or fermented shrimp paste. Combine the rice, a piece of the kare-kare dish and a pinch of bagoong will keep you ask for more. You’ll have a taste of the natural flavor of the meat, the creamy peanut sauce and that pinch of bagoong binds all that flavor together in to one savory dish. 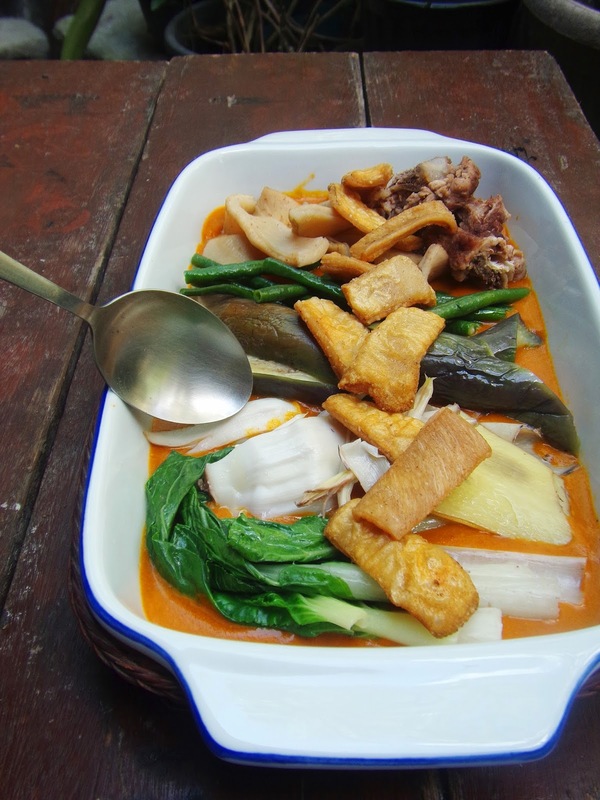 Nowadays, you will find different kind of kare-kare made of fish, pork, beef and for those who have a budget, seafoods kare-kare. You will always find pork and beef at its fork tender state. There is nothing bad about it. How about boiling the meat to tenderness and then deep frying it? You will produce a nice crispy piece of meat. Adding this to the usual kare-kare dish will add another texture to the dish. You’ll have a nice soft crispy vegetables, soft tender meat and another nice crispy meat. Adding a nice crispy part of meat on the usual kare-kare is what I have in mind. Initially, I want to add a nicely done lechon kawali or pork cracklings but my parents, specially my mom would have a sky rocketing blood pressure reading. So I just used the lovely beef tripe we usually cooked with kare-kare. This has a nice soft texture when boiled to tenderness. Then I deep fried some of this and used it as a topping in the kare-kare. I also added about half a kilo of beef bones for that extra beefy flavor. Clean beef tripe and place in a pressure cooker. Add bay leaf, Italian seasoning, ginger and water to cover everything and boil for 40 minutes. Remove from heat and discard the boiled water. This is to remove the fowl smell of the meat. Place the beef tripe and bones in a pressure cooker. Add garlic, onion, salt and pepper. Add enough water to cover everything. Pressure cook for 1 hour. Remove half of the beef tripe and cool. Deep fry until golden brown and set aside. Add garlic and onion in the broth and simmer for 10 minutes. Add peanut butter and mix until well incorporated. Add annatto-water mixture. Add banana blossom and yardlong beans and simmer for 3 minutes. Add Eggplant and simmer for another 5 minutes. Add bok choy and simmer for another minute. Add salt. Dissolved cornstarch in water and gradually add to the dish until desired consistency is achieved. Topped with crispy beef tripe and served with sauteed bagoong. Yeah! I'm eating more rice than usual. Why don't you try it too.